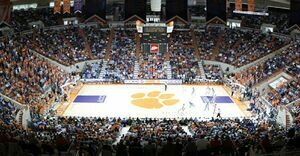 Littlejohn Coliseum is home to Clemson University's basketball team and also plays host to a wide variety of concerts and shows and is the location of all of the university's graduation ceremonies. The coliseum was recently renovated and reopened on January 5, 2003. The overall building square footage is 167,500 sq. ft.
Littlejohn Coliseum was erected 1967-1968 on the site of what had been several streets of post-World War II temporary housing. Built to replace the Field House Big Gym, Clemson played its first basketball game in the new arena on November 30, 1968, defeating Georgia Tech, 76-72. It is named for James Corcoran Littlejohn, Class of 1908, who served for many decades as Clemson's business manager. This page was last modified on 26 January 2010, at 08:10.